We’ve come through the long season of Easter. We’ve reflected on the meaning of the Cross and the Resurrection. We’ve heard the promise of Pentecost and a word about the Triune nature of God. Through all of this we have been reminded that God is revealed to us in ways that transform and reconcile the universe. Having already heard the story of one Centurion who responds to the Gospel (Acts 10), we hear another here. As Pope Francis reminded us recently, God can make God’s self known to and redeem even those who seem unlikely candidates – even atheists. It is clear from the biblical text that God can find faith in unexpected places, and lives will then be changed. Boundaries are important, but only in relationship to the center. Not every profession of faith is of equal value. Some theologies are demeaning both to God and to humanity. We needn’t affirm the validity of every theology in order to welcome the other into our midst – or allow ourselves to be welcomed by the other. There are two texts that speak of boundaries – 1 Kings 18 and Galatians 1 – while the third text opens the doors. As we try to hear the voice of God in these texts, perhaps we need to hear both voices. The story of Elijah and the prophets of Baal is well known. The preparers of the lectionary leave out the “battle” between Elijah and the prophets of Baal. We don’t get to hear Elijah mock his opponents who can’t seem to get Baal to light their altar fire. Perhaps they should have brought in the Doors to sing for them. They try hard but fail to get their way. Then, in our passage, Elijah gets his turn. Ahab had been seduced by his “foreign” wife to allow the prophets and priests of her home religion to have control of the nation’s religious life. Elijah is on the margins, but he doesn’t seem at all afraid. So, he challenges the prophets of Baal to this contest. When they fail to achieve success, Elijah makes sure everyone knows that Yahweh is the victor. After the Baal prophets fail, Elijah gathers the people close to him on Mt. Carmel, and invites them to help him build a large altar of stones, and then dig a moat around it, filling it with water. He also poured water on the sacrificial pier. Only then, after Elijah made it look like it would be impossible to light the sacrifice, does he turn to God and pray. And he tells God to answer in a way that would make it clear to everyone who was Lord, who is the one true God. If God is going to answer his prayers, Elijah wants to leave no doubts about who is in charge. And if as on cue, God answers by consuming everything with divine fire – not just the sacrifice, but the wood, the stones, and the dust, even licking up the water in the trench. There should be no doubt now. So choose God!! Of course as the story goes on, the people keep on following a different path. It just shows how fickle we are! But God has made it clear who is in charge. The backdrop to the reading from Galatians is the apparent attempt by an outside group to introduce a legalistic version of the Christian faith into this newly formed Christian community. This teaching centered on the place of circumcision, which was a marker of Jewish life. The debate going on in the church at the time concerned the degree to which Jewish law and custom should define the Christian community. The message that Paul preaches distinguishes between that which is necessary for life in the community and that which is not. Circumcision has its place within Judaism, but he’s not of the opinion that Gentiles, many of whom found this requirement to be an unbreachable barrier to baptism, is necessary. Instead of making this requirement, Paul preached a message of divine grace received by faith. After Paul moves on a group comes to the community challenging this position, and in doing so misrepresent Judaism. As Paul writes this letter he seeks to reinforce the earlier message that God’s grace not circumcision was the marker of one’s place in the community. In making this plea, Paul is raising the question of authority. Who represents the wisdom of God? Paul may seem arrogant, but he makes the claim that he had introduced them to the Gospel and that this outside group was seeking to confuse them and change the Gospel of Christ. He is so adamant about this that he pronounces a curse on anyone teaching something different. So what is the basis of his authority? He claims here that the Gospel he preaches isn’t of human origin. He didn’t learn it from any human teacher. Instead, he received it as direct revelation from Jesus Christ. Of course the question is – how do we know this to be true? That is the task of discernment. Where does the truth lie? If the first two readings focus on boundaries, the reading from the Gospel of Luke reminds us that God can reach beyond them. Faith can be found in the most unlikely places. In this case it’s a Roman Centurion. Like Cornelius in Acts 10, this Centurion is known for his respect for and even devotion to the Jewish faith. He is described as loving the Jewish people, going so far as building a synagogue in Capernaum. Those who come to Jesus and make a request of him are the leaders of this Jewish community. They come bearing news that a servant of this Centurion, a servant who was very important to him, was dying. They came hoping that Jesus would bring healing to this servant. “And Jesus went with them” (vs. 6 CEB). Unlike Peter, Jesus didn’t need a divine revelation. He heard the call and went with the group toward the Centurion’s house. But before they could reach the house, the Centurion sent word to Jesus. His representatives told Jesus that he needn’t come any further. There is a sense here that the Centurion understood Jewish law, that it would be inappropriate for a Jew to enter a Gentile home (the problem facing Peter as well). Thus, the claim that he isn’t worthy of Jesus’ visit. The Centurion, however, does offer a solution. He understands the chain of command. He understands authority. All Jesus needs to do is say the word and the servant will be healed. The result is that the servant is healed. 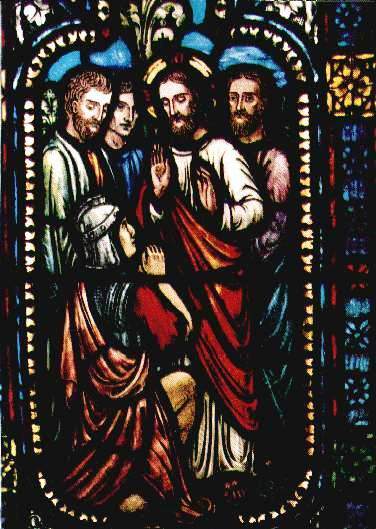 But the key point is Jesus’ own observation – his recognition of the faith that the Centurion expressed. Not even in Israel, among his people, did he find such faith. Jesus never enters the Centurion’s home. He never faces the dilemma that would come from such an act. There’s no sense here that the Centurion became a disciple of Jesus -- unlike Cornelius. He was simply the beneficiary of divine grace. This raises important questions about the way God works. Could God work outside the church? Even if the church is the normal means of divine work, is God limited by the boundaries? As we think about this question of how and where God works, what boundaries there may be, we might well heed the words of Pope Francis, mentioned above, who offered a rather broad definition of the redeemed. He even posed the possibility that atheists might be among the redeemed. How do we know? Francis suggested that it is in the fruit, the good works, that we know this truth. It’s not that anything goes, but it does mean that there are many who don’t believe as do we, and yet they offer signs of God’s grace in their lives. In offering this view Francis wasn’t saying anything new. It’s just a bit unexpected in this day when the choices appear to be “anything goes” or rigid boundaries. For Christians, there is a need to recognize our center – the one who defines for us what is real and what is true. We name this center Jesus. As we tend to this center then the boundaries take care of themselves, and we are freed to represent and live the gospel of grace. [i] Douglas John Hall, What Christianity Is Not: An Exercise in 'Negative' Theology, (Eugene, OR: Cascade Books, 2013), p. 162.